I'd like to start by thanking you for exploring the fantastically interesting world of Chenopodium ambrosioides. I can just about guarantee that you will learn something new and interesting on this site. My hope is that after you have read through the information you will come to appreciate the vastly diverse and somewhat overlooked realm of plants, and more importantly come to appreciate the uniqueness of Chenopodium ambrosioides. The plant Chenopodium ambrosioides may not ring a bell to you, render an image in your mind, or even sound like English (well that’s because it’s not) but to millions of people around the world one of its numerous common names surely would sound familiar. Some of these more common names that this plant referred to by include, Mexican tea and American Wormseed, for a complete list of common names see Classification. It's no coincidence that most Americans would not recognize this plant because in the states this plant is considered a weed and for the most part unobserved, but in central and South America hundreds to thousands of people rely on this plant for much of their livelihood. See Fun Facts and Medicinal Uses. 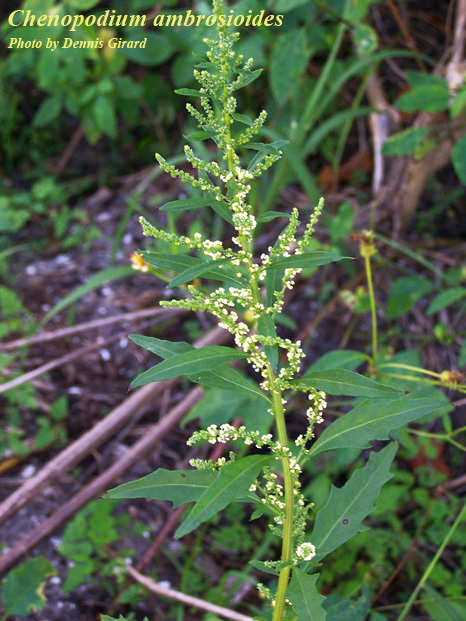 This website is dedicated to providing information about Chenopodium ambrosioides and is part of a larger project on multipleorganisms.net that is committed to providing information about literally hundreds of different organisms around the world. I, Megan McCarthy, have created this site and I hope you enjoy exploring the exciting world that is Chenopodium ambrosioides.